Our hunts are conducted on over 25,000 acres here in the heart of the beautiful Texas Hill Country. I carry all the Exotic & Super African Exotic Species * Whitetail * Wild Hogs * Turkey * and Dove & Duck Game for your next great hunting adventure. You can choose any method of collection on your hunts from Bow, Rifle, In-Line Muzzle Loader, Handgun or Primitive Arms. I offer Blind, Spot & Stalk and Safari Hunts. My Guide Fee Service is $250.00 per Hunter, and does include the skinning & dressing of your game. This is not a per day fee, it is based on 2 days of Hunting. Should you choose to stay additional days the Guide fee is $100.00 per day after your first initial two days of hunting. 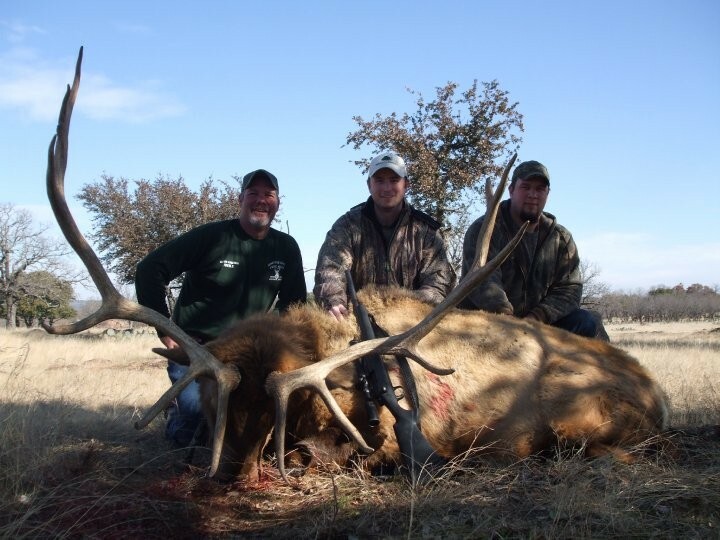 There are no additional Kill, Trophy, Gun, Non-Hunting Guest or Day Hunt Fees attached to our hunts. With us you only pay for your Game, Guide Service and Lodging should you choose to stay and lodge at the ranch. My company is based on the belief that the Hunters expectations are of the utmost importance. My entire team is committed to meeting those needs. As a result, a high percentage of my business is from repeat customers and referrals. I diligently strive to keep hunting affordable all year round. 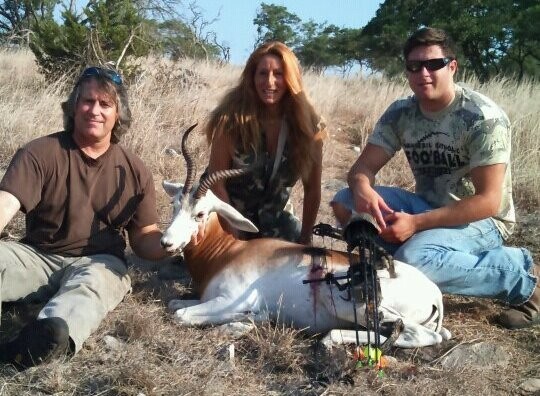 I can accommodate everything from my New World Record, Diamond & Gold Class hunts to my High Quality Meat Hunts. I am a complete Full Service Hunting Operation. I offer * Taxidermy * Processing & Shipping * Professional Guide Services * Cold storage * Ice Machines * Official Safari Club International (SCI) * Trophy Game Records of the World (TGR) * Boone & Crockett (B&C) Scoring & Entry of your game * Private Pilot Charter Flights * Bass Fishing *Lodging*We also provide you the opprtunity to purchase Texas Hunting & Fishing License once you arrive at the ranch to make it more convenient for you. We strive for "PERSONAL QUALITY"...over "Impersonal Quantity". Our goal is focused on providing our Hunters & Guest high-quality service and customer satisfaction. We will do everything we can to not only Meet...but Exceed your expectations on your hunting adventure with us. We have a massive selection of different Exotic & Rare Super African Game to choose from. 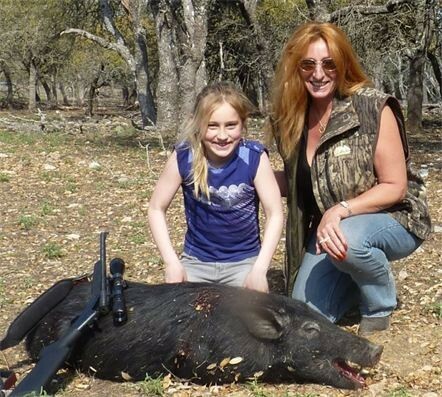 We offer Whitetail, Wild Hogs, Turkey & Bird hunts. We provide affordable hunting all year round. We can accommodate everything from our High-Quality Meat Hunts to our Trophy New World Record, Diamond & Gold Class Hunts. Our Award Winning Records speak for themselves about the Quality of our Game, and our repeat Cliental and referrals sustains our Reputation of our Affordability of our greatly discounted prices. We are looking extremely forward to providing you with your next Affordable & Successful Hunting Adventure with us. Look around our website and if you have any questions, please do not hesitate to contact us for additional assistance. I am honored to provide my complimentary "HUNTS FOR HOPE" for our "WOUNDED WARRIORS" & "CHILDREN BATTLING TERMINAL ILLNESSES".